Brand Activation. Corporate Photo Booth. Event Photography. Brand Marketing. We are your brand activation company and with Step Inside My Booth, we provides an experience that enables your brand to jump start and engage directly with consumers. These campaigns, events or experience help build your brand loyalty. By utilizing our services including photo booths, event photography and social media you can reach your marketing goals. 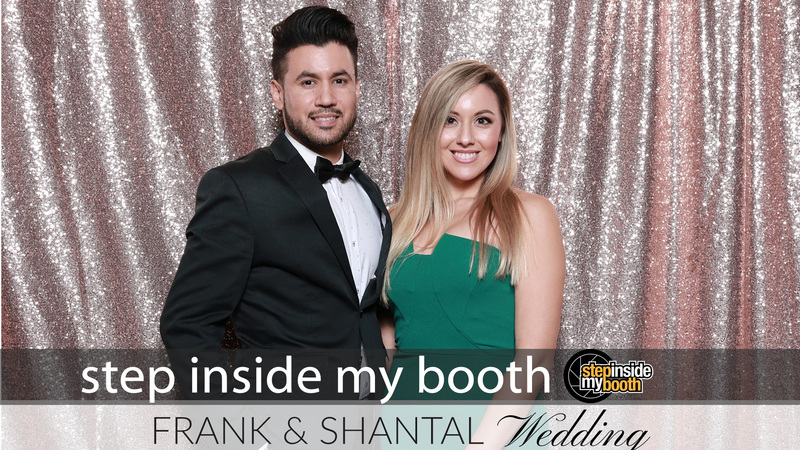 Our photo booths, social media kiosks, table and pop-up banners are all brand-able in our packages. Increase your on site engagement and brand awareness by allowing your guests to use our kiosks to share photos instantly online via SMS text messaging, email and social sites like Facebook® or Instagram® . We also provide lead captures and by utilizing this information, you can create leads for future campaigns. Our media including photo prints, digital and photo frames will allow clients to expand your audience with these simple yet effective marketing tools and spread brand awareness. Step Inside My Booth clients have utilized these services by placing their own coupon codes and discounts on our media. Roaming photography or stationary photography for 6 hours inclusive of photography with 1 branded tension fabric on a 6ft table. Custom branded 4×6 prints with logo and up to 4 reprints per photo. Prints are available in under a minute. Ask about our brandable photo frames. Extended hourly rates are negotiable. Custom photo booth fully wrapped using your brand (37” wide by 72” height), includes brandable ipad/tv stand with basic graphic artwork, great for showcasing photos for guests and sharing digital photos. Photo booth includes 8 hours of usage, unlimited sessions, with up to 4 reprints of photos for guests. Discounts available for multi-day rental (trade shows, convention center) . Custom photo booth fully wrapped using your brand (37” wide by 72” height), includes brandable ipad/tv stand, 2 extra social kiosk stands with basic graphic artwork, great for showcasing photos for guests and sharing digital photos, event photography for 4 hours. Photo booth includes 8 hours of usage, unlimited sessions, with up to 4 reprints of photos for guests. Discounts available for multi-day rental (trade shows, convention center). Step Inside My Booth photos print with unique URL links for easy downloading to your mobile device or PC. Give it a try now, click the sample link www.simyb.co/INQFG754 or type it on your mobile device or PC. Step Inside My Booth is the newest trend in parties. Step Inside My Booth provides entertainment for all ages and all kinds of events. 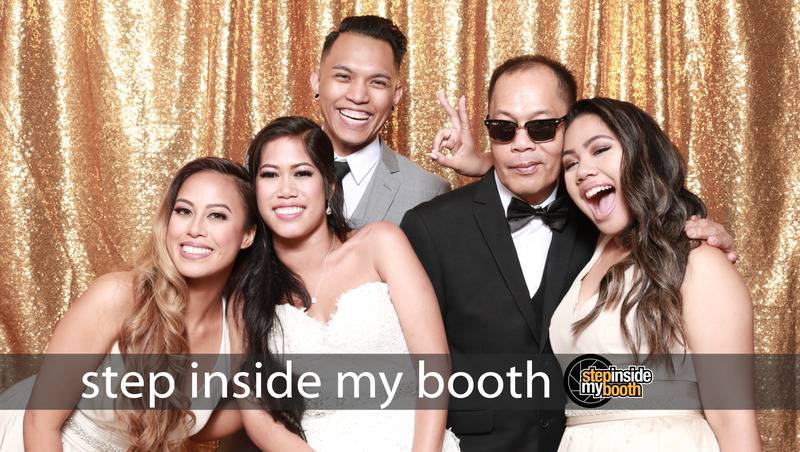 Whether it is a Sweeet 16 Party, Quinceañera’s (15th birthday), Debut (Filipino 18th birthday), graduations, corporate, school prom or an anniversary, Step Inside My Booth is sure to be a big hit. We bring fun filled entertaiment and unforgettable experience that everyone will remember and all your guests will have a copy of images to keep! Our photo booth can be either open air style or enclosed around in drapes in either black or white background. We offer silver, gold, navy blue, maroon sequin backdrops as well. Our booth optimal area size is 8ft by 8ft at its largest size and need an 8ft ceiling clearance (if indoors) and this setup can accommodate 8-10 persons. For smaller booth size a 4ft by 4ft area would accommodate 2-4 persons. It can be situated inside or outside (if weather permits) and must have power outlet accessible within 25ft. We offer high quality PVC sign props (never cardboard or paper with a stick). We excel in designing new props and customize it to your event (free 6 signs for 3 hours or more). Most of our signs are 10″ x 5″ and are very durable PVC signs, with 1/4in thickness. After taking a picture, a digital copy will automatically be upload to a designated website for easy sharing to your favorite social media app. We can customize it so images are also sent to an email after your photo has been taken to send to you or your guests. (Hi-speed internet/wifi required at venue). We now offer custom vinyl photo booth wrapping for branding your event. We wrap our photo booth with your logo or any advertising graphics to help market your brand. 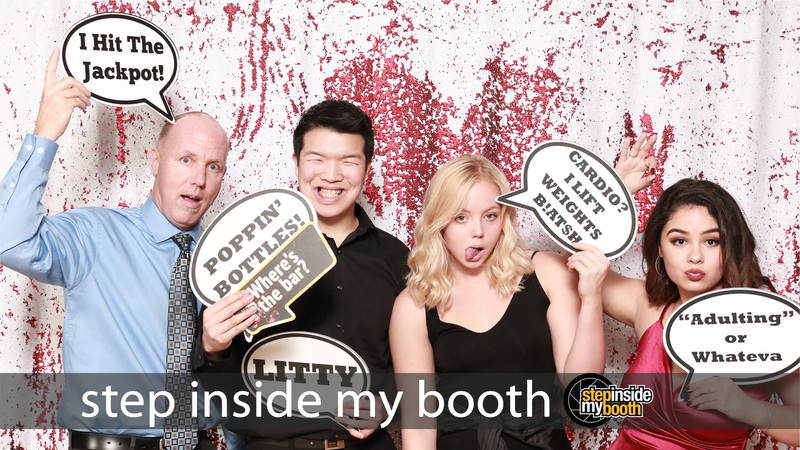 Our custom photo booth is a great marketing tool for bigger events like trade shows or any special event where vendors can display their products. Our client Live Fit. Apparel at the recent LA Fit Expo Jan 2016 used our custom photo booth in conjunction with their coupon code to give discounts to any one who used the photo booth and shared the photo online. Contact us for details. 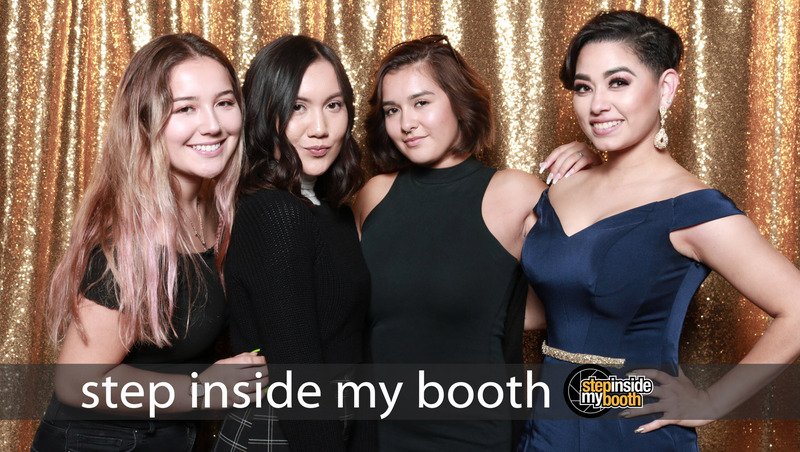 Step Inside My Booth offers quality and accessibility – great quality photos, sturdy props, customized lay out, and instant photo sharing from their website. Our guests were able to share their photos soon after! Instant gratification at its best! Ron is definitely flexible to work with. We want our photo booth to have a studio feel since our venue had a great vintage fireplace which was the perfect backdrop! He helped us achieve our vision and our guests had a blast with the vintage feel! I highly recommend Ron for his professionalism, quality service and advanced features! Check out his website and you’ll get more options to to choose from! – Jen and Ryan #jenniryan. Great communication, very professional, worth every penny and would recommend this company to anyone. Pictures came out great was helpful through the beg. to the end. We will be using them in the future. Contact us for special on going photo booth packages. We could be having a special non-advertised sale! Not valid with any other promotions or coupons , void where prohibited. Pricing are inclusive within 60 miles from Stanton, CA. $550.00 – Event roaming photographer includes 3 hours of shooting, and auto-printing of up to 4 copies at our print kiosk. Please fill up our booking inquiry below to get a detailed quote for your event. Choose the date on the calendar you wish to reserve our photo booth service. If a date is grayed out, choose another date and note the date you wish to reserve, and we will try to accommoate your request, otherwise we are booked that day. Your date is officially booked and saved for your event once we create a contract for your event and a deposit or agreement has been reach with Step Inside My Booth. Check your spam or junk mail if you have not received your email to verify your inquiry and make sure to click the verification link. 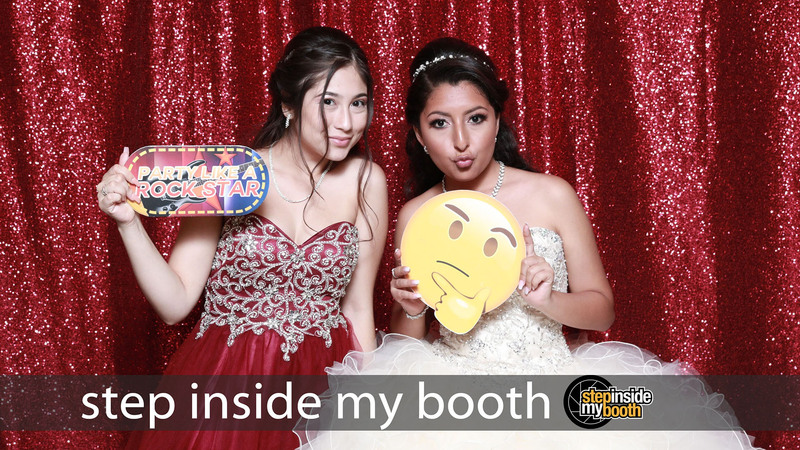 What kind of event is your photo booth being rented for? 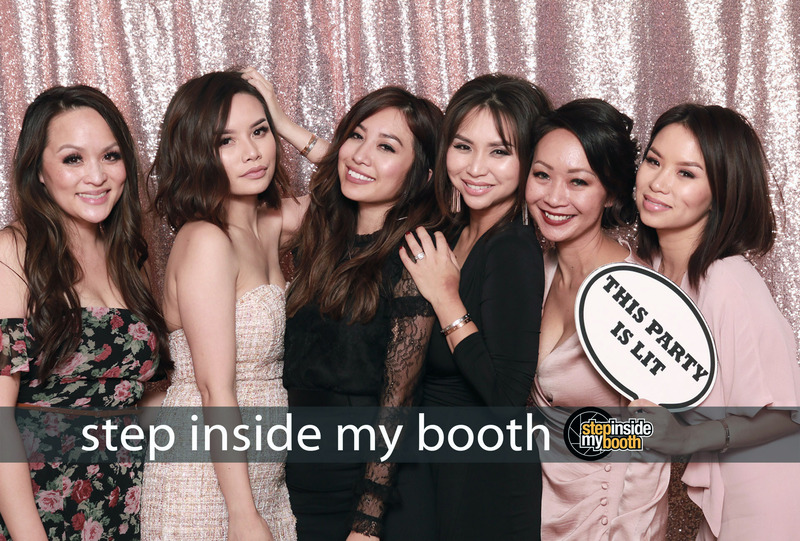 Desired location of photo booth? What kind of booth do you need? How old are majority of your guests? Anything else the photo booth renter should know? Enter a Mobile Number below and make sure you have the device in your possesion as you will receive a SMS verification code when you press the Send Code button. Enter Verifcation Code below for our 2 step process. *Disclaimer: Data Rates and Charges may apply (check with your Mobile Network Carrier if you will be charged for receiving SMS messages or data charges). Verifcation code was successfully sent. To reserve your photo booth, select date from Booking Inquiry Link.